An interview with the band members to support the release of their debut album – Knock Me Off My Feet. 1. Is Spatial Unity a band or more of an inventive musical project? Tell us who’s involved and about your history and why you do it? Andy P: The band was originally put together as a project where three artists could be free to artistically produce their own music together. I suppose you could have referred to it as a rally call! To expand, most of our previous musical careers involved doing what other people want; whereas Spatial Unity is all about music-freedom and creating what we want. The exciting thing about this project is that it is evolving all the time. 2. Who or what are your influences? Andy P: A cliché, however I love anything that is funky or with a great groove, dreamy and makes you feel good. I adore bands like Zero 7, The Cinematic Orchestra and Fila Brazillia etc, although these artists use a lot of samples in their work which can be overdone. Alternatively, I enjoy the buzz we are creating with Spatial Unity and creating great sounds but with a more natural live feel to it. 3. What modern artists do you like? Andy P: Zero 7, Lemon Jelly, The Cinematic Orchestra, Carl Craig, Fila Brazillia, Groove Amada, Saint Germaine, Telepopmusik, Ordinary Boys, The Bravery, Kevin Shields (although I wouldn’t call Kevin modern now). 4. Where did the name come from what does it mean? Andy P: The band has many close friends in different parts of the world. The name was inspired from the idea that technology can bring people together; and although we are geographically divided we are still close; thus spatial (divided) unity (together). Besides, all of the other cheesy names were taken. 5. What inspires you to write your music/lyrics? Andy M: Life experiences, sometimes just having a few chords that sound good. I like the texture of words and sometimes don’t even focus on their meaning. I like to inspire others to. I also like to use a humorous twist on occasion. Andy P: Hey I am a percussionist. I start with a good groove and then build harmonic and melodic phrases around it. I find lyrics too personal and struggle with this. I am better when collaborating with others, therefore helping them with ideas etc. Andy M on the other hand is an incredible lyricist. No I am not crying I just have a little dust in my eye. 6. Name your all time fave track by another band/artist? Andy P: Oh Bu**er that’s like been asked to tell a joke on the spot. Hmmm can I come back to this question? 7. What are your ambitions for your music? Where do you see yourself in 5 years? Andy M: I love the theatrical side of things and would love to put shows on that are visually inspiring as well as musically…Pink Floyd kind of thing I guess. Andy P: First and foremost we want the world to hear and enjoy our music. We want to continue to create great songs our way and share it with everyone. Success means the ability to do for a living what you truly love to do; for me this would involve creating and producing music all day long, whether it be our own material or a project collaboration. Moreover, working with Andy M is great fun – like two school boys playing Xbox all day. As a musician/producer, I have been told that I have a natural gift and can take something that is rarely good and make it sound incredible. Eventually I would like to use industry learned skills to continue working with Andy M and company and also with other wonderful and talented upcoming acts. I would like us to land a big block buster movie; that would be cool! 8. How would you describe your music and what genre do you think it fits into? Andy P: We have many influences; I would brand our music as a fusion of Pop Indie-Rock with also Electronica thrown in. As mentioned, our music is very much enriched by contemporary and electronic sounds but we have a deliberate natural and live feel to it which is achieved by Andy Murray’s amazing guitar work, and also by the use of live drums / percussion and bass. No samples are used (yet). 9. Where was your new single recorded and who was producing? 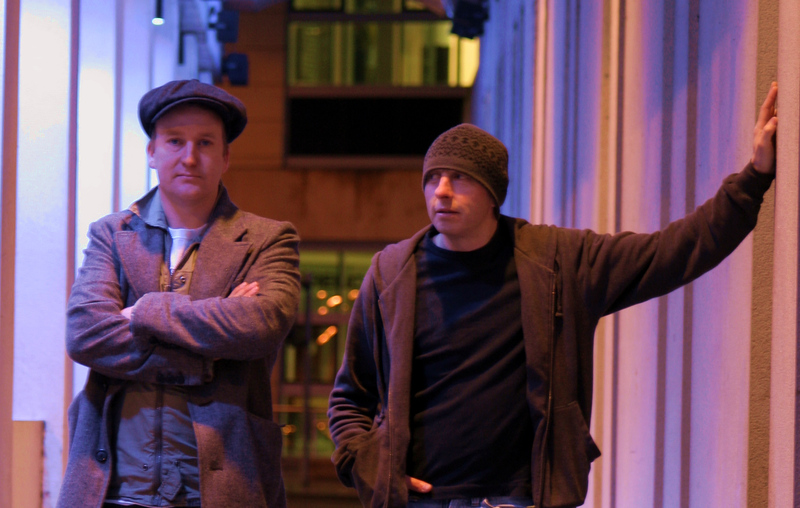 Andy P: The new single Knock Me Off My Feet was recorded in Scotland at Greenside Studio. The song was self produced by myself and Andy Murray. This is a successful partnership as it creates a good medium for the style of music. This song was a fascinating project and it was intriguing to witness how the song progressed and developed its character. 10. Who are the members of Spatial Unity and what do they play? 11. We think music and food has combined in a big way with celebrity rock and pop stars now appearing and cooking on TV food shows. Can you give us your favourite recipe? Andy P: Hey, I thought this was a rock n roll interview? Where are all the questions about trashing hotel rooms? LOL – Oh well, while I am at it, I love cooking and eating omelettes. Pre-heat Extra Virgin Olive Oil, mix three eggs with a dash of milk and whisk. Fry Mushrooms, peppers, then add the eggs. Use ground-pepper and oregano then grate some cheese on top. Bonisimo! Other than that, you can’t beat a good old bbq! Andy M: Rice pasta. Cook the pasta for 4 minutes, add pesto sauce, sprinkle of pepper, and some grated cheese on top with pine nuts. It approx takes 10 minutes and it’s delicious. 12. Your music has a very up to date and modern feel while still sounding organic and classic at times…What sort of software/equipment are you using to create your music? Andy P: The early stuff (recorded in Denmark) was in a typical high-profile stereotype recording studio environment with the band and session musicians recording together at once. This gives it its distinctive live indie rock feel. The new material, including the new single “Knock Me Off My Feet” was recorded and produced in Greenside Studio Scotland using a combination of analogue outboard mixers and other gear combined with high-tech computerised digital recording equipment. The approach was to use natural acoustic drums, layered with classic electro drums sounds such as 808 and 909 emulators (Dreams Come True), and combined with real bass, and acoustic and electric guitar. Synth sounds were also computerized. As for that classic signature Hammond sound; that is a secret!